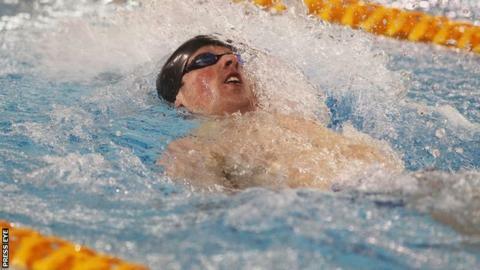 Jordan Sloan has become the fourth Northern Ireland swimmer to achieve a Commonwealth Games nomination time. Sloan, 20, achieved the 50m backstroke mark when he produced a time of 26.12 in the heats on the final morning of the Irish Championships in Dublin. The Bangor swimmer's time was .26 inside the Glasgow nomination mark. Sloan joins Sycerika McMahon, Curtis Coulter and Michael Dawson as those who, subject to ratification, will represent Northern Ireland this summer. Sloan went on to duck under the nomination time again in the semis and final but wasn't quite as quick although he took the Irish title in 26.36 seconds. Also on Sunday, Coulter won the 50m freestyle in 23.23. In the heats he swam 23.03 which was one-hundredth outside a second nomination time for the Ards swimmer. There are a number of swimmers with the consideration times in various events who may also be put forward to the Northern Ireland Commonwealth Games Council for selection. They include David Thompson (20) in the 100m freestyle who would complete a potential 4x100m medley relay team with Coulter, Dawson and Sloan while Conor Munn (18) has the time in the 50m freestyle and could go in a 4x100m freestyle relay team. Paralympic gold medalist Bethany Firth also has a consideration time in the 50m fly, as do Gemma Kane (15) in the 200m fly, Danielle Hill (14) in the 50m backstroke and 14 year-old Rachel Bethel who produced an excellent swim to finish second in Saturday's 400m freestyle final in a time of 4:22.76. However Beth Carson looks set to miss out after failing to make a consideration time. A fall over the Christmas period saw the Irish international swimmer break her ankle and miss two months of training and despite being back in the pool over the past few weeks, the qualifying period, which ended on Sunday, has finished too soon. Swim Ulster set down tough qualifying standards wanting swimmers who get selected for Glasgow to be able to makes semis and potentially finals. Ards club man Dawson did it in Thursday's semi-final of the 50 metres breaststroke on the first day of the Irish Championships on Thursday. Dawson clocked a time of 29.01 - inside the needed 29.09 - in finishing second behind Barry Murphy. Coulter secured his time in the first leg of the 4x100m freestyle relay. He clocked 50.32 in first leg for Ards and as it was from the blocks, the time counted and was inside the nomination standard of 50.43.